Tree Removal - Why Cut Down a Tree? Do you have an old, dying tree that is both an eyesore as well as a potential hazard? There can be any number of reasons to remove a tree (see below), but regardless of your rational, call Evansville Tree Service to have it removed efficiently and safely. We know better than most, the benefits and value of trees in your landscape. 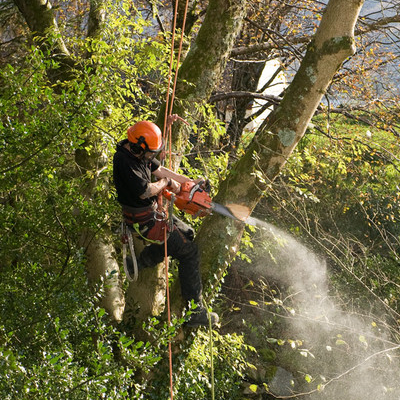 However, there are a number of situations where tree removal is your best option, in terms of "tree care". If a tree is a problem in your landscape (think too much shade to grow grass), damaged due to storms, too near property structures or power lines, or just not desirable in your landscaping, we can remove it for you. Our highly trained and credentialed tree service professionals have been safely removing trees in the Evansville, IN area for over 20 years. No matter the reason for removal, call the tree services Evansville trust to provide the best quality tree care. 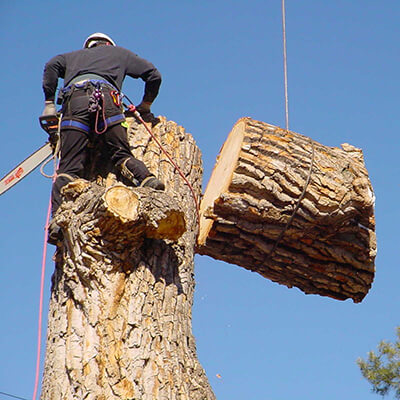 The process of tree removal, while not complex, does involve specialized skills, knowledge, and equipment, certainly this is true for large mature trees; and trees that are close to property structures or electrical lines are even more delicate to removal safely and efficiently. Further, multiple-trunked trees, like locusts, are fairly more involved to remove due to the trunks leaning, often towards a home. While the average homeowner can certainly remove smaller trees in their landscape, large mature trees should always be left to the professionals. Tree removal begins with either one of our climbs scaling the tree crown or reaching that same level with a bucket truck. We will use a truck if it can easily access the tree without damaging nearby landscaping; otherwise, we will simply climb the tree to being the removal process. 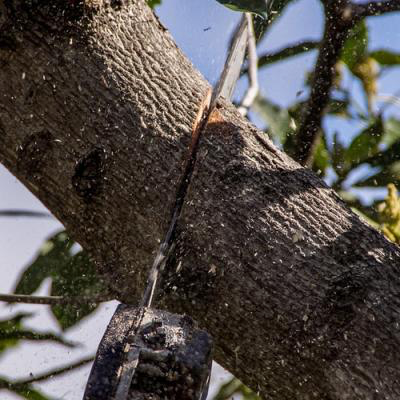 Once securing near the top of the tree, our climber will begin to remove branch by branch, safely lowering them to the ground where our ground crew will further reduce them into three-foot sections. This wood can either be hauled away or stacked in a convenient location on your property. If the wood is of burning quality, like most hardwoods are, it will provide excellent firewood. Softwood trees generally are not good for firewood. As our climber reduces the tree further, at some point we will be left with only the trunk. At that point, we can cut the trunk down to a height suitable for your purposes or grinding. During this entire operation, our ground crew will ensure the area around the tree is keep clean and smaller branches are removed and chipped up. Tree removals, even for the largest species, generally take one day or less. Stump grinding following the removal is generally scheduled for the following day or week, depending on our schedule and yours. Throughout the entire process, Evansville Tree Service will ensure our crews' safety and the protection of your property. We are licensed and insured for your protection against any accidents or damage, which is rare but nevertheless prudent. When we leave your property that day, all evidence of our work will be eliminated other than one removed tree. The ground will be entirely racked and picked up of all tree debris.